The Myanmar Army has now started clubbing the Arakan Army along with the ARSA to give the impression that the two outfits work together when it is not so! The idea appears to be that once the AA is declared a terrorist outfit, it will be easier to deal with them as no support from other countries would be forthcoming and even the UN agencies would stop talking about violation of human rights and intensification of the “annihilation campaign” begun by the Tatmadaw (Myanmar Army) in the aftermath of the attack of security posts in Rakhine State that is already creating an exodus of thousands of innocent civilians from the conflict area. The Arakan Army is not fighting for independence of Rakhine State but are seeking a confederal status, just like the UWSA on the China border. While the UWSA is having a cease fire since 1989 and a peace deal since 2013, thus enjoying a de facto confederal status, the Myanmar Army and the its Government appear to be in no mood to consider a cease fire or dialogue with the Arakan Army. The Arakan Army is led by a popular General Twan Hrat Naing and it is supported by over 95 percent of the population. They are a proud people and are fighting for self- respect. But what the Myanmar Army Is doing is to club the insurgent outfit- the AA along with the Jihadi terrorist outfit -the ARSA. It started with the allegation of the Myanmar authorities that the ARSA and the AA are having bases in the Mayu mountains in Bangladesh- to be specific three by ARSA on one side and two by the AA on the other. 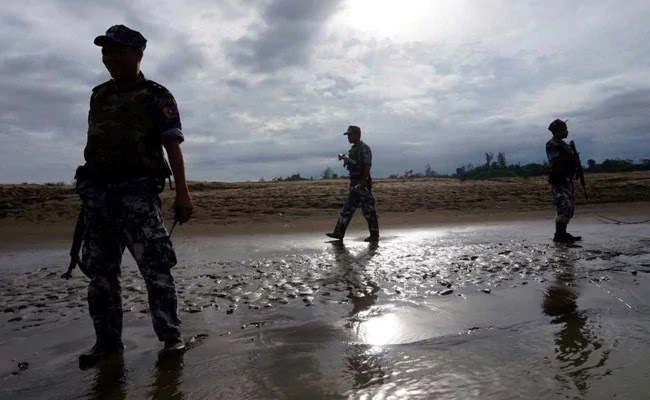 This has been refuted by the Bangladesh authorities who are aware of the danger of ARSA spreading its influence among the Rohingya refugees in Cox Bazaar. Recently on 22nd December, the RAB of Bangladesh killed the top ARSA commander (from Harakat-Yaman) in a gunfight in the Teknaf sub district of Cox’s Bazaar. In the third week of January, the Tatmadaw Chief Min Aug Hlaing met Sun Guoxing, Special Envoy of Asian Affairs in the Ministry of Foreign Affairs in China at Nay Pyi Taw. In the meeting they discussed about the activities of ARSA and AA and strongly criticized the latter for the attack on the security posts of Myanmar. 2.Support of China towards the Myanmar Government and Army in international community. 4.Endeavour of the Army to achieve eternal peace by 2020 and support and assistance of China for such endeavours. 5.Cooperation of twocountries in ensuring peace and stability in the northern region of Myanmar. Significantly, the Chinese were concerned only about stability of the northern region on their border and are not concerned about the serious conflict going on the India- Bangladesh border. Though the Arakan Army is part of the Northern Alliance for which China has hosted two meetings in Yunnan between the Myanmar peace mission and the Alliance Representatives, they have not pressed for a cease fire or for a dialogue with the Arakan Army. Clubbing the AA with the Jihadi outfit appears to be a clever ploy to designate the AA at some point as a terrorist outfit though the AA is not one.